“Stop, think, and don’t do something stupid!” This is the warning Dr. Robert Bea drills into his civil and environmental engineering students at the University of California in Berkeley. There is an intangible and invisible marketplace within our lives today where the products traded are fourfold: attention, distraction, data and meaning. 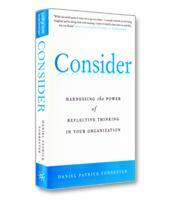 The stories and examples within Consider by Daniel Patrick Forrester demonstrate that the best decisions, insights, ideas and outcomes result when we take sufficient time to think and reflect.